Over the course of the past week, multiple former Ohio State wrestlers have come forward to say they were sexually abused by former team doctor Richard Strauss during his tenure at the university, which ran from 1978 to 1998. Many of the wrestlers have also said that Republican Congressman Jim Jordan, who was an assistant coach on the OSU wrestling team from 1986 to 1994, had to have known what Strauss was up to while he was with the team. Jordan, the head of House’s ultra-conservative Freedom Caucus, has repeatedly denied that he knew about or ignored the abuse. and has personally attacked one of the accusers, Mike DiSabato. 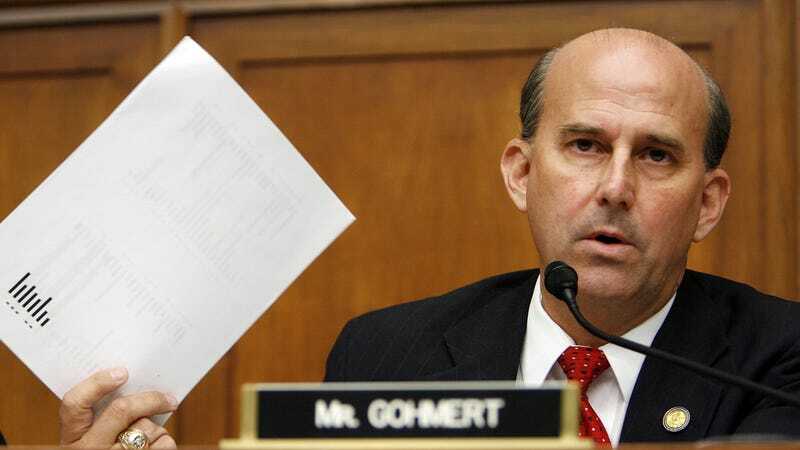 He’s already received president Tump’s support, and now he’s gotten a particularly appalling endorsement from fellow Freedom Caucus member Louis Gohmert. Because shame is no longer a concept that politicians have to concern themselves with, Gohmert statement makes three points: 1) the wrestlers who have come forward are clearly just part of a left-wing character assassination campaign 2) the wrestlers were grown men when the abuse happened, and thus it is suspicious that they didn’t come forward sooner 3) Strauss is dead now, anyway, so what’s the big deal? Jim Jordan is a fine and decent person who has a lifetime history of being honorable and honest, unlike his accusers whose extremely troubled backgrounds and ongoing legal and financial troubles place the veracity of their allegations into the realm of ridiculous. This has every appearance of greed trying to gain twice from the same smear. First, trying to finally have a successful law suit against Ohio State University after failed previous claims. Second, whatever payments were received for trying to destroy President Trump may be available to destroy other high-achieving Republicans, like Jim Jordan. Given the inclusion of Perkins Coie in the mix, the likelihood increases that money has already changed hands to purchase a drive-by character assassination of beloved conservative Republican Congressman Jim Jordan. I personally vouch for the integrity of Jim Jordan. There seems to be an absence of people vouching for the upstanding character of his accusers.